Recorded live during the 2015 Hillsong conference in Sydney, Open Heaven River Wild is an atmospheric addition to Hillsong's canon. Want to experience the live worship of Hillsong, but without a plane trip to Australia? 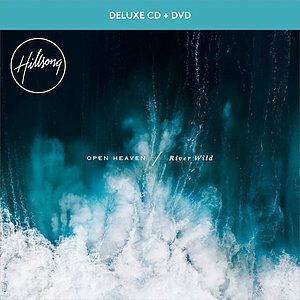 OPEN HEAVEN / River Wild is the 2015 Live worship CD from Hillsong, recorded at their conference in Sydney. This deluxe edition features all 12 tracks, plus 4 bonus songs, that enable you to experience live worship atmosphere. "There is something special about understanding that when we encounter Christ, we live under an Open Heaven. What should our response be? If we are immersed in His mercy, then His Living Water can run wild through us. This is the premise of this album. Our posture, our response to His compassion and grace. With songs such as the title track, Open Heaven (River Wild), O Praise The Name (Anastasis), Transfiguration, One Thing and Love On The Line. We pray this album will impact individuals in both corporate and personal worship times." - Hillsong Worship. The team behind Open Heaven River Wild includes Reuben Morgan, Ben Fielding, Matt Crocker, Joel Houston, Jonathan JD Douglass, Jad Gillies, Marty Sampson, Annie Garratt, Nigel Hendroff and Autumn Hardman, under the leadership of Global Creative Pastor Cass Langton and her husband Rich. Previous live Hillsong CDs have introduced songs used around the globe in churches every week. These include; 'Shout to the Lord', 'Mighty to Save', 'Cornerstone' and 'Forever Reign'. We're sure that the title track 'Open Heaven' will feature on this list in the very near future. Open Heaven River Wild CD/DVD by Hillsong was published by Hillsong in October 2015 and is our 2454th best seller. The ISBN for Open Heaven River Wild CD/DVD is 9320428310002. A great listen...Hillsong songs always bring you closer to God...outstanding worship. CD is great...I must watch the DVD soon! Got a question? No problem! Just click here to ask us about Open Heaven River Wild CD/DVD. "There is something special about understanding that when we encounter Christ, we live under an Open Heaven. What should our response be? If we are immersed in His mercy, then His Living Water can run wild through us. "This is the premise of this album. Our posture, our response to His compassion and grace. With songs such as the title track, Open Heaven (River Wild), O Praise The Name (An?stasis), Transfiguration, One Thing and Love On The Line. We pray this album will impact individuals in both corporate and personal worship times." - Hillsong Worship. Now Playing: O Praise the Name Anastasis Your browser does not support the audio element.